Fiat's Marchionne says talks between Magna and Opel are "not going very well." VENICE, Italy (Reuters) -- Fiat's existing bid for General Motors' Opel is its best offer, CEO Sergio Marchionne said amid conflicting reports about the status of Magna International Inc.'s deal for the German carmaker. "I don't believe we could improve Fiat's offer. It's the most rational one we can put forward from an industrial viewpoint," Marchionne said Friday on the sidelines of an event. Fiat, which now controls Chrysler Group LLC, bid for Opel last month but did not continue into a second round of talks. GM and Canada's Magna, North America's largest auto parts supplier, hope to close the sale of a majority stake in Opel by the middle of September, ahead of Germany's elections, an Opel supervisory board member told Reuters on Friday. But Marchionne said he had heard talks with Magna were "not going very well" and added: "We have confirmed our interest." Bloomberg News reported Friday that GM may sign non-binding agreements with the two other runners-up in the Opel bidding as a “fallback” to the deal with Magna. The companies are Belgian private equity firm RHJ International SA and China's Beijing Automotive Industry Holding Co., Bloomberg said, citing people familiar with the talks. The report said the GM-Magna talks have been snagged by disagreements over the use of GM's technology and engineering designs. 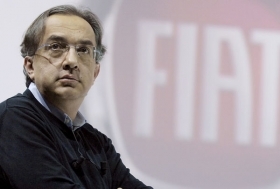 Marchionne said Fiat was close to a deal on a venture with China's Guangzhou Automobile Industry Group -- something which has been brewing for over a year. "We'll see in the next few days. We are finalizing some steps. However, we are there," Marchionne said. Fiat had "good results" on both its home market of Italy and in Europe during June, Marchionne said. The company's sales were down 3.5 percent in Italy in May giving it a market share of 34.4 percent, slightly up from a year earlier. Its sales in Europe rose 2 percent in May. Marchionne said Europe would lag the United States in any recovery of the car market. "America will start up again in the second half of 2009; Europe will be there later," he said. He confirmed the company's targets for 2009 and said cash flow had improved since December. In January, it said 2009 group trading profit should be over 1 billion euros, down from 3.36 billion euros in 2008. Cash flow this year should be more than 1 billion euros. Turning to Chrysler, which he is now running, Marchionne said soon he hoped to sort out which product lines would continue. Said Marchionne: "Hopefully in the next 14 days we will clean that up and we will have at least a roadmap from a product standpoint."